Participatory approaches to tackling themes of community, heritage, family, diversity, local history and industry. When I think back to Middle Bound, which took place at QUAD Feb – March 2018, I realise how easy it is to forget how special and rare it is to hold a participatory/community created and inspired exhibition within the context of QUAD’s main gallery walls. 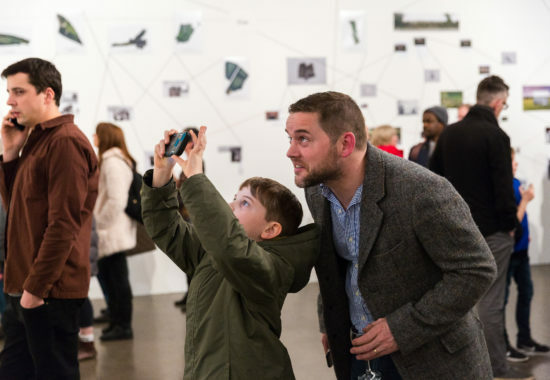 Let me put this in a little context… Participation is at the heart of everything we do at QUAD, but we’re also a digitally creating hub for the East Midlands and are committed to providing a high quality offer of digital art work for the public to have access to and explore. A balance that isn’t always easy in a main gallery space. Currently on display in the main gallery is a season of VR, displaying works by acclaimed digital artist Rebecca Allen and newly commissioned work by artist Zane Zelmene. The works on display demonstrate QUAD’s ability to bring digital, high quality, visually beautiful, high concept artworks to Derby’s cultural offer. When you compare this to Middle Bound, it gives you an idea just how special it was to show work of the local community, by the local community. Middle Bound: ‘Exploring the Social Fabric at the Heart of England’ was a new site-specific installation by the artist Patrick Waterhouse and the graphic designer Tim Wan with the support of curator Mauro Bedoni, involving local artists and stories from the public into a narrative display. 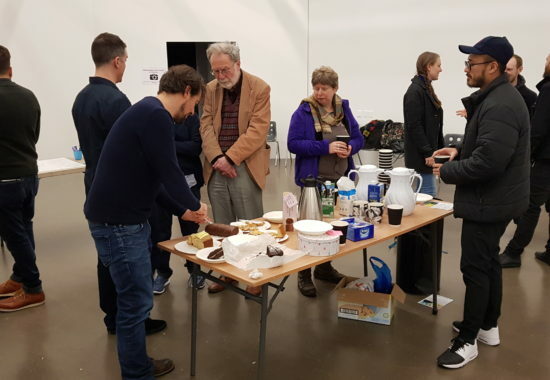 From 5th-9th February, the QUAD Gallery became a workshop and open studio, made accessible to the public, where artistic and creative work could be viewed as it happened with the goal of developing, conceptualising and building an exhibition. 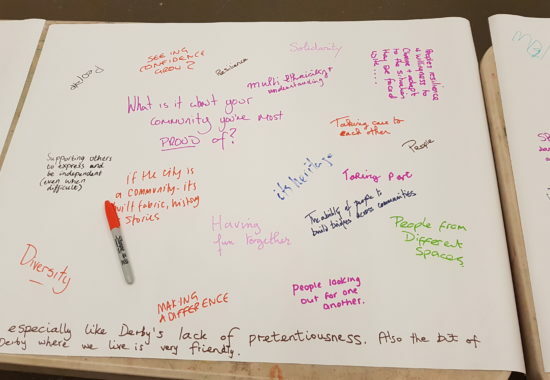 Artists, designers, photographers and members of the community were selected through an open call and explored questions like: What are the communities that make The Midlands what it is today, and how they relate to each other? What are the stories we tell? How does ethnicity and heritage affect attitudes? Prior to the workshop and open studio, and to inspire the creative participants, local communities were invited to a ‘Cake and Cuppa’ community open event, where they were encouraged to share their stories and experiences of what community meant to them and how they identified themselves within their immediate community and wider society of The Midlands. This was not the audience you would normally expect in a contemporary visual art gallery space, but it certainly was refreshing to see. Even before the work by the artists had begun, the space itself started to visually represent the people and places from surrounding areas and beyond. 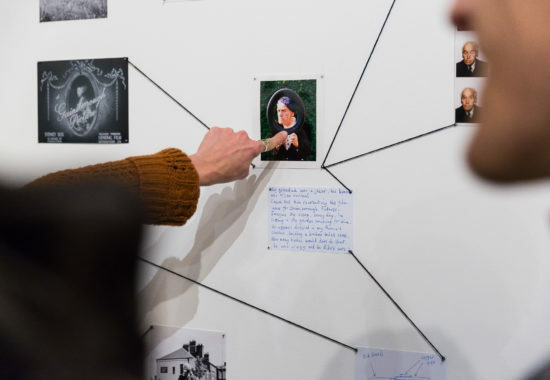 The resulting exhibition’s interlinking narratives displayed a passage of time by the overlaying of images and weaving together the people, places and things that bind the Midlands together. The exhibition took on all aspects of life: cultural diversity of life today, the industry and leisure of the Midlands, rural and urban life, dwells into family, personal history of people and their archives. Testament to the creative vision of Patrick Waterhouse, Tim Wan and Mauro Bedoni, the work was expansive, sprawling, with no clear start or end points. It gave the impression that more could be added, represented, expanded upon, while also being whole. A fitting visual representation of the local community residing itself the gallery space. The resulting exhibition, although only on display for four weeks, attracted nearly 2200 visitors. The Participants – including artists, designers, photographers and members of the community – are: Farhad Berahman, Daniela Bayfield, Rica Cerbarano, Attilio Fiumarella, Shirley Hitchcock, Lynne Hollingsworth, Jessica Hollinshead, Tim Kay, Sally Kesterton, Fanni Kopácsi, Patricia Nimmo, Tristan Poyser, Richard Richards, David Severn, Tim Shore and Thomas Tierney.